Michael C Campbell has been located and is safe. No other information will be released. Michael C Campbell has been located and is safe. No other information will be released. Thank You for to the public for sharing our post last night! 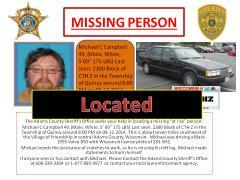 Michael C Campbell 49, (Male, White, 5’ 09” 175 LBS) Last seen: 2300 Block of CTH Z in the Township of Quincy around 8:00 PM on 08-12-2014. This is about seven miles southwest of the Village of Friendship in central Adams County, Wisconsin. Michael was driving a Black 1995 Volvo 850 with Wisconsin license plate of 283-SHZ. Michael needs the assistance of crutches to walk, as he is missing his left leg. Michael made statements to harm himself. If anyone sees or has contact with Michael, Please Contact the Adams County Sheriff’s Office at 608-339-3304 or 1-877-885-9977 or contact your local law enforcement agency.